The popular image of Salafi Muslims in Egypt is of a lower-class, older generation, perhaps limited in educational achievement. This is not their fault, many might patronizingly sympathize, as President Mubarak is blamed for letting the school system rot to keep the population ignorant, poor, and non-threatening to his rule. It is commonly stated as well he allowed the Salafi trend to prosper at the expense of the Muslim Brotherhood, because their religious orientation preached obedience to the Muslim ruler, no matter his flaws. However useful this description may be, it does not comprise the whole of Egyptian Salafism, and a clear example is Ahmad al-Qadri. At the time of this interview Qadri was an advisor to the Salafi Nour Party in energy affairs. 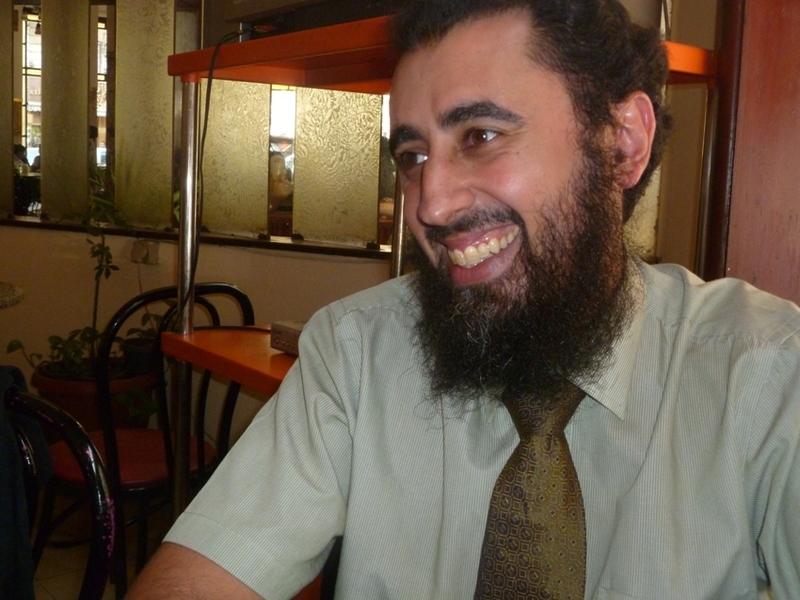 He is now the official English language spokesman for the Salafi Watan Party, which recently split away. These political developments can be read here, but this article is more a profile of him and his worldview. For Qadri, his grayness was exposed by life abroad. He studied for his PhD at Strathclyde University in the UK from 2006-2009, and immediately found the local Muslim community to be either black or white, secular or religious. The psychology of minority status pushed immigrant Muslims either to seek integration with the larger culture, or else to dive deeply into their own religious heritage. Glasgow as a city was about 17% Muslim – mostly Pakistani – while the university could be as much as 30%. From the beginning Qadri was tested. The university committee to welcome new students served wine at their reception. Women freely extended their hands to greet him. Upon polite refusal – as an ordinary Egyptian Muslim, not as a fanatic – he was politely asked why, and what relation Islam had to such social awkwardness. These experiences pushed him to read subjects he cared little about while growing up. His personal studies led him to the books and YouTube sermons of popular Egyptian Salafi scholars like Muhammad Hassān and Muhammad ‘Abd al-Maqsūd. By 2007 he started growing out his beard. He eventually became vice-president of the Muslim Students Association at his university, which was composed primarily of Salafi students from the Persian Gulf and North Africa. Even so, Salafis should be differentiated from other Islamist groups, though all agree on the necessity of applying sharia law. The Muslim Brotherhood has a Salafi orientation, but desires to change society from the top. For this reason they seek political power. The problem will be, however, if they do not perform well society will reject them. This may cause the loss of the whole sharia project. There are other Islamists who have sought to live according to sharia law in other ways – ways rejected by Salafis. Some, such as Takfir wa Hijrah (Excommunication and Exodus), curse society as non-Muslim and form isolated communities to themselves. Some such groups then move further along into advocating violence to overthrow the government and seize power. Such jihadis are also ‘Salafi’ in the manner of viewing Islam through the lens of the Qur’an and Hadith, but are rejected by the mainstream Salafi movement. Salafi leaders such as ‘Imād ‘Abd al-Ghaffūr and Yūsrī Hammād have traveled to Sinai where many extremist have taken refuge to convince tribal leaders and the youth the jihadi perspective is wrong. Jihadis themselves, however, cannot be talked to at all, as Qadri finds them unwilling to accept anyone as a Muslim except themselves. Additionally, Salafis support a law against denigration of religions which would apply equally to Christians and Jews. This law, however, would not prevent conversion from one religion to another, or to none at all. Nor would such a law apply to the conversation, or even the printing, of one religion respectfully describing the other. A Christian can freely communicate that for them, Islam is a false religion and Muhammad was a liar. Several years ago a highly visible convert to Christianity, Muhammad Hijāzī, created a stir in the media. Salafi groups raised no case against him. In this area Qadri was more difficult to understand, for he stated as well that there should be censorship of thoughts that harm the Islamic religion to keep sectarian strife from society. He also defended the case brought against Nasr Abu Zayd, who was sued for his academic writings on Islam. The court referred the case to the Azhar, which ruled they proved him a non-Muslim. As such, he was ordered to divorce his wife, and he fled to the Netherlands for asylum leaving his wife behind. In explanation, Qadri stated a Muslim is free to become a non-Muslim, but if so he forfeits his rights. A family should be protected from the shame of having their daughter be married to a non-Muslim at any point in her life. Furthermore, the apostate will lose his Islamic inheritance rights. Yet he is free to join another creed, and even free to publish his reasons why. This privilege does not extend to non-monotheistic religions, however. A Muslim may become a Buddhist in his heart, but no community of Buddhists may build a temple in Egypt. The same applies to Shi’a Islam. Qadri presents these opinions as shared by the Egyptian Salafi community, many of which are not young, know no English, and are far more comfortable conversing over ancient texts. Is this accurate? Or has Qadri learned the art of speaking to the West, having been tested in the hallowed halls of Scotland academia? Perhaps there are generational gaps. Perhaps there are educational gaps. Among all peoples there are frauds and charlatans, politicians and propagandists. The testimony here is only that Qadri was a very nice, pleasant individual, who appeared to speak sincerely and passionately about his faith. Judgment on the Salafi movement can only be rendered upon how they benefit – or damage – Egypt, but in his demeanor it is hoped that the Salafi community will demonstrate Qadri to be a standard representative.